The U.S. Fish and Wildlife Service today announced that all chimpanzees, both captive and wild, will be classified as endangered under the Endangered Species Act. Whereas wild chimpanzees have been listed as endangered since 1990, captive chimps were listed as threatened. The move has implications for animals being held for biomedical research purposes. "Extending captive chimpanzees the protections afforded their endangered cousins in the wild will ensure humane treatment and restrict commercial activities under the Endangered Species Act," said FWS Director Dan Ashe. "The decision responds to growing threats to the species and aligns the chimpanzee's status with existing legal requirements. Meanwhile, we will continue to work with range states to ensure the continued survival and recovery of chimpanzees in the wild." The ruling brings the FWS into compliance with the Endangered Species Act, which states that both wild and captive animals of the same species must share the same classification. 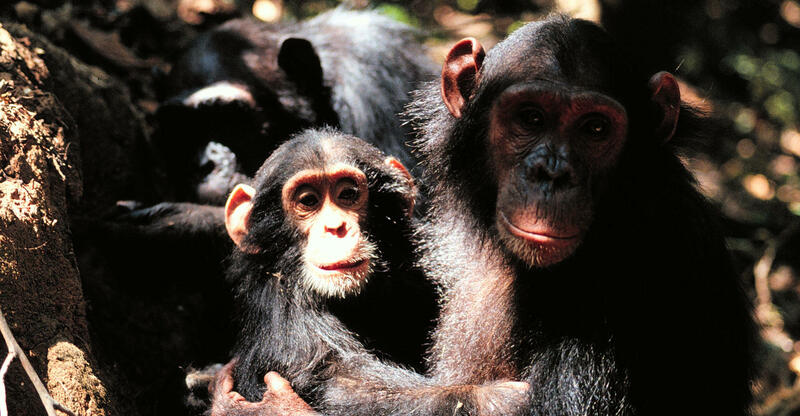 In 2010, a coalition of conservation organizations, led by the Jane Goodall Institute, petitioned the agency to extend endangered status to captive chimpanzees, prompting a formal investigation. "This will be enormously beneficial to individuals in inappropriate captive conditions. As such it is a tremendously significant decision which will be welcomed by everyone concerned with the well-being of our closest living relatives. Thank you for helping to make their world a better place," remarked Dr. Jane Goodall. Widespread poaching, habitat destruction and outbreaks of disease have devastated chimpanzee populations in recent years. The new listing will formally go into effect on September 14, 2015. A clever chimp uses four different tools to crack open a bee's nest high above the forest floor. One slip could mean death.